What you couldn't see before is suddenly so close you can almost touch it. That's because PENTAX premium level quality and clarity are within reach, at a price that's within reach, too. Every Z-series model is built for critical observation. PENTAX: designed to delight the most demanding users. Designed to inspire the most dedicated enthusiasts. Birders and Hunters: we think you'll find exactly what you're looking for. Looking for greater color accuracy and resolution in the great outdoors? 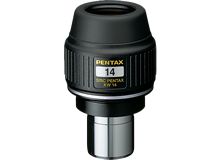 Check out the ED glass optical elements on all of our PENTAX Spotting Scopes. Select from 45ﾂｰ angle or straight models to fit your viewing situation. Don't worry about weather; all models are waterproof to a depth of 1m, fog-proof, and nitrogen filled (JIS Class 6) to handle the most extreme conditions. And the rotating tripod collar allows positioning the scope for comfortable viewing. High-performance, wide-angle eyepieces for use with high-grade spotting scope.